This talented pup can perform cool tricks: fur Real Ricky, the trick-loving' interactive plush pet toy flips his bone, shakes "paws", and can even bark a tune! Ricky, the Trick-Lovin’ Interactive Plush Pet Toy is ready to perform tricks, and is sure to entertain! 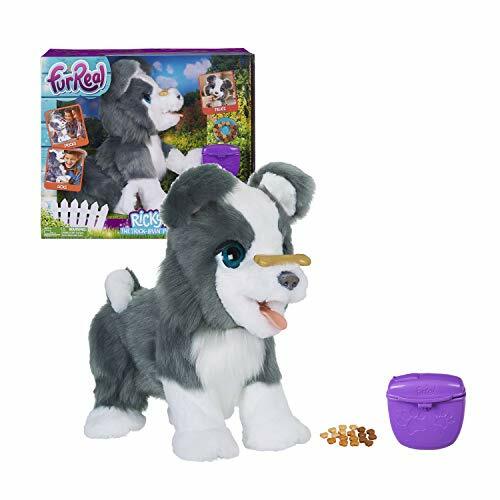 This poseable pup can balance his bone toy on his nose… and with a voice command or loud sound, flip it into his mouth! Press his paw and he’ll respond by raising it for a friendly handshake. He’s so eager to do tricks, he’ll often shuffle his paws in sheer excitement. He gives affectionate doggie licks as well, and enjoys his play treats anytime (and what goes in… must come out!). furReal and all related characters are trademarks of Hasbro.